Bitcoins are created through reward for successfully mining a block. The current reward as of writing is 12.5 BTC per block. Referring to the bitcoin history, the current bitcoin in circulation is around 16,378,375, and a year ago it was 15,628,475. So there is 749,900 bitcoins being mined in between. The rate of a successful mining is around 10 minutes. Assuming this, in one year there should be 24 * 60 / 10 * 12.5 * 365 bitcoins created. That is 657,000 and this theoretical value doesn’t quite add up with the history as this only amounts to 87.6% to the historic value. Close, but more than 10% than expected. It turns out, in fact, there is a mechanism built-in to the bitcoin to halve the reward as a form of inflation. A month from now will mark the anniversary for the last Bitcoin reward halving from 25 BTC to 12.5 BTC. This change is by design and happened twice as expected in the past, from 50 to 25, to 12.5 as of time of writing. Therefore during the period mentioned above where 749,900 are mined there are times when the reward was 25 and some other 12.5. A rough calculation shown the current reward, which is 12.5 BTC per block, applies to 334 days during that 365-day period. Revising the calculation of the theoretical value resulted in 712,800 bitcoins. Taking into account this fact the estimation improved from 88% to 95% of historical values. This entry was posted in approximation, bitcoin, Blockchain and tagged 12.5, 25, 50, bitcoin, bitcoin inflation, coinbase, reward on June 8, 2017 by gmgolem. When eyes are tired code is not as easy to read. 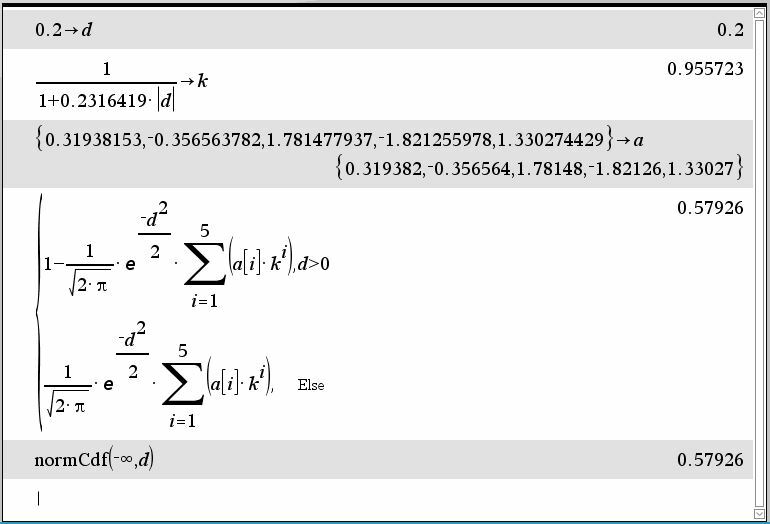 Once such example below from a Monte Carlo CUDA sample calculating CDF. With the help of the expand() function in Nspire, this code snippet suddenly become obvious. This entry was posted in approximation, Chebyshev, TI Nspire CX CAS and tagged approximation, calculator, Chebyshev, TI nspire on November 4, 2015 by gmgolem. Apart from the approximation method by means of the Taylor function, another numerical technique which is considered by most as the de facto method is the Chebyshev approximation. In TI Nspire, the calculation can be done as below. The piece-wise function helps to decide the result from whether d is positive. For better performance, some constants can be pre-calculated instead of as shown below, like the square root of double π. Intensive calculations definitely will benefit from pre-calculated values. This entry was posted in approximation, calculator, Chebyshev, TI Nspire CX CAS and tagged approximation, Chebyshev, TI nspire on August 22, 2015 by gmgolem.